Good news travels fast – and apparently, pretty far. After a Good News Network story about the first rural diabetes center in the US, which educates and cares for children free of charge in Kansas, a West Virginia children’s hospital received a gift of one million dollars to replicate the project there. Oil and gas businessman and former West Virginia legislator Mike Ross read about the Rector Diabetes Education and Resource Center in Kansas, and having been a keen supporter of diabetes research for many years, decided that he wanted to help start a similar program in his state. What touched him about the original story is the similarity between himself (with a grandson who battles Type 1 diabetes) and the benefactor of the Kansas clinic, Kelly Rector, also a grandfather, who was motivated to fund the diabetes initiative because his grandson was born with the same disease, yet the family had difficulty in finding services in the rural part of that state. 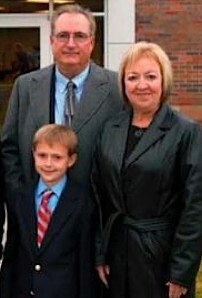 The Rector Diabetes Center received a call from the WVU Children’s Hospital after development officers at West Virginia University, who are regular subscribers to the Good News Network, noticed some striking similarities between Mr. Ross and the Rector Family in Parsons, Kansas (photo, left). They secured the name and e-mail address of Rector, and administrators talked on the phone exchanging much information about how to repeat what they had done in the Midwest. Mr. Ross agreed that this diabetes care model provided the perfect vehicle for him to give back his community in a substantial way. Thanks to the Ross family, WVU Children’s Hospital will be able to expand its services to provide more patient education and care for those who can’t afford it. 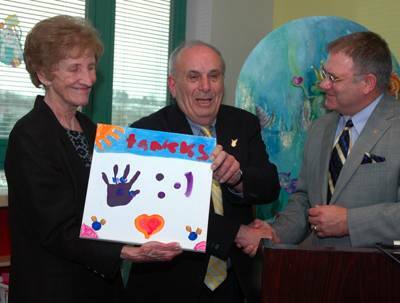 “His magnificent gift will mean more children will get diabetes treatment, more diabetes outreach and education programs will be provided in rural communities – and more research will be conducted,” said Mimi Wilson, development officer for the WVU School of Medicine. It is interesting to note that Mike Ross, while a member of the WV State Legislature, helped establish The West Virginia Research Trust Fund, which is today resulting in a dollar-for-dollar match for the research portion (40 percent) of his gift, literally doubling its impact and the chance that one day – maybe in West Virginia – someone will find a cure for Type 1 diabetes. congratulations, Geri – you’re helping change the world! Thanks, Chris! Very cool, right? Go GNN ! I have been with Geri and her amazing project for a few years now and being from the health care world, this one has really got my attention. Isn’t it amazing what one determined person can do?